The FOX line-up shrank from last week’s midseason premieres. FOX: EMPIRE tied its series low 1.7, down 0.3 from last week, and STAR fell 0.2 to 1.3. ABC: THE GOLDBERGS slipped 0.1 to 1.3, and ALEX INC dropped 0.2 from last week’s series premiere to 0.9. MODERN FAMILY gained 0.1 to 1.5, and AMERICAN HOUSEWIFE returned from a week off down 0.1 to 1.2. 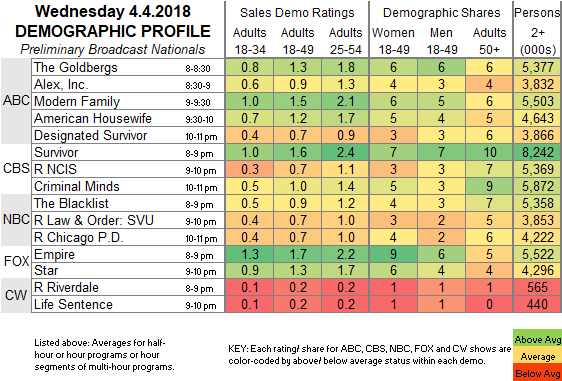 DESIGNATED SURVIVOR held at 0.7. 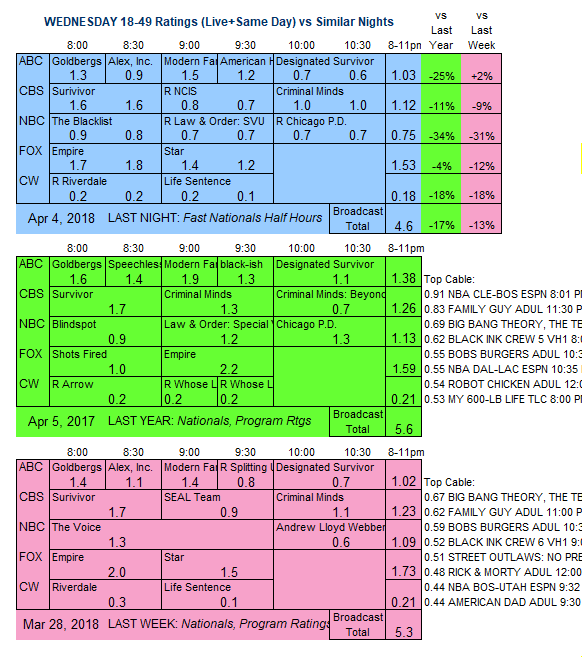 NBC: THE BLACKLIST aired its first episode in 3 weeks, steady at 0.9. Reruns followed at 0.7/0.7. CBS: SURVIVOR lost 0.1 to 1.6, and CRIMINAL MINDS was down 0.1 to 1.0, with an NCIS rerun between them at 0.7. CW: LIFE SENTENCE’s final Wednesday episode was up 0.1 to 0.2. The night began with a RIVERDALE rerun at 0.2. IMPOSTERS begins its 2nd season on Bravo tonight. In addition, for reasons it hasn’t yet explained, FX airs tonight’s ATLANTA without commercials.